Bacon… those tasty strips of piggy flesh that could bring a man to his knees, weeping for joy. Thick or thin, crispy or chewy, there’s just no way to go wrong: it’s all good. Bacon has become pretty trendy in the foodie world, with bloggers sampling it in just about anything conceivable, all for the glory and honor of coming up with the next big bacon thing. From the more tame bacon chocolate chip cookies to the wild bacon implosion, there aren’t many frontiers left for bacon. Just about everyone has been there, done that. What is it exactly about this breakfast meat that has made it so popular though? I like a good piece or two of bacon with my pancakes but to be honest, I never went ga-ga over it before the craze. It’s forbidden by two major religions, reputed to be an artery-clogging heart stopper, and a mocking presence to vegetarians and vegans everywhere. 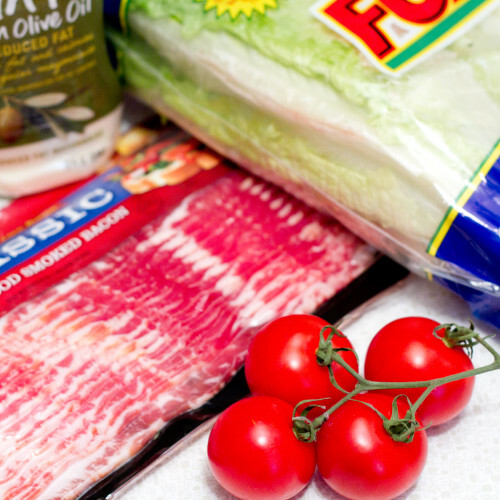 With all this against it, how has bacon become such a rock star? I don’t have any answers…but I do have bacon. 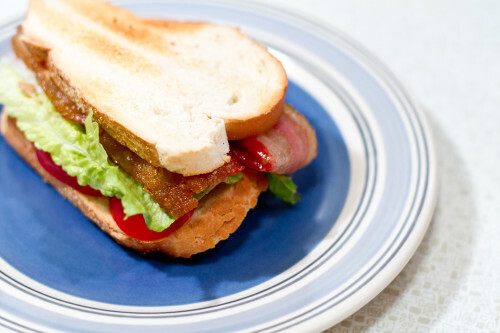 And while a traditional, good old-fashioned BLT is a perfect way to enjoy it, I suggest you take it one step further and candy your bacon first. It’s unbelievably addictive. You’re welcome. Line a rimmed cookie sheet with foil or parchment paper and place a cooling rack inside it. 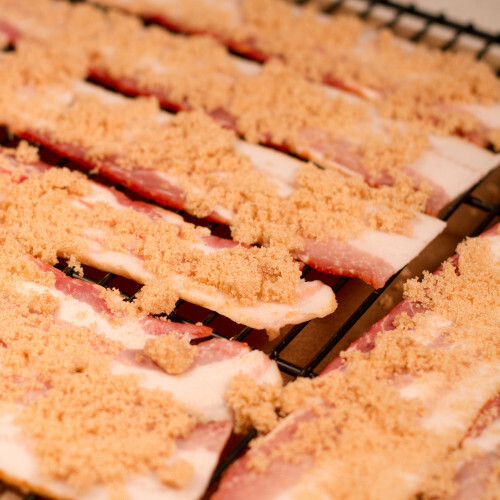 Lay out the strips of bacon on the cooling rack and sprinkle brown sugar on them liberally (you can sprinkle on cayenne in addition to the brown sugar, but I prefer it without). Put cookie sheet on the middle rack in the oven and set to 400 degrees Fahrenheit. Bake for 10 minutes, then flip the strips, apply more brown sugar, and return to the oven for 10 more minutes, or until it’s done to you’re liking. Once cooled, this bacon confection will have you craving a daily dose of porky perfection–sorry, Wilbur. I have a most deep lusty passion for BACON.